Almost 20 years in, and the live-action superhero boom is finally learning its lesson: Success means standing out. 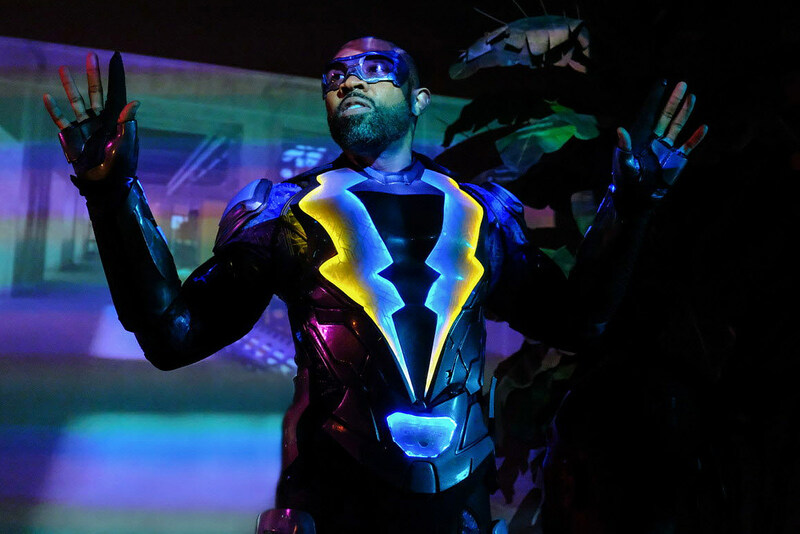 The CW has gone to the superhero origin story at least three times now, yet Black Lightning feels like the first one with a true purpose beyond “I have powers, time to save my city!” Cress Williams’ Jefferson Pierce isn’t some fresh-faced do-gooder; he’s a grizzled, reluctant hero who left his life of violence behind, and believes the good he does as principal of Garfield High will eventually outweigh the gang violence and police corruption that plagues Freeland. He’s the kind of man who doesn’t heroically disarm a gang member who came to the school for trouble, but reminds him that pulling a gun will revoke his parole, and give cops with already-itchy trigger fingers license to kill another black man with impunity. That’s what’s so refreshing about the two episodes screened for critics (the first is available on the CW, the second airs Tuesday); Black Lightning’s costumed heroism and flashy powers take up surprisingly few minutes of screen time. Jefferson only suits up to rescue his daughters* or track down a criminal looking to stifle their testimony, and it isn’t until gang violence hits closer to home that the scales finally tip. The threat of his daughters losing their father or a chance to reconcile with his wife Lynn (Christine Adams) isn’t enough to continue turning a blind eye. To paraphrase Jefferson’s tailor and “guy in the chair” partner Peter Gambi (Dexter alum James Remar), the lion wasn’t meant to live in a cage. *If there’s one seeming holdover from more traditional superhero stories, it’s that Jefferson’s daughters aren’t aware of his identity as Black Lightning. The character quit some nine years before they came of age, but secret-keeping has limited dramatic value and it feels like a missed opportunity to involve them more in the story. Two episodes isn’t much time to get a sense of Black Lightning, and it remains to be seen if future seasons will stretch the tight serialized pace over a full 22 episodes. Still, Black Lightning feels like it’s in full command of its tone after just two hours; rivaling Marvel’s Luke Cage with an impressive soundtrack and Atlanta aesthetic that feels more like our world than its CW predecessors. As a result, I’m hard-pressed to argue with the decision to keep Black Lightning out of Arrow-verse – the last thing this show needs is to punctuate grounded gang violence with the Flash popping out of a portal. Black Lightning is exactly the jolt of reality this genre needed – an inspiring, but jaded and vulnerable hero at a time ugly divisions of the past have come roaring back. On the subject of other superheroes – it’s mentioned in exposition that other individuals with powers at least exist in this world. Whether that’s meant to suggest that Black Lightning will bring in other DC superheroes independent of the Arrow-verse remains to be seen. If you’ve seen the pilot, you’ll know Anissa is clearly coming into powers of her own. It’s notably refreshing that a later conversation sees her attempting to rationalize how she destroyed that sink. What did Peter Parker ever say about it to Aunt May and Uncle Ben? The series uses a fair amount of terse language about race – a little jarring for a CW series, but a credit to the reality these characters live in. Black Lightning will continue airing Tuesdays at 9:00 P.M. on The CW.